What if you could enroll in an online studio workshop and feel like I am sitting right next to you, walking you through each step of the process? What if you could enjoy the beauty of a self-paced workshop with lifetime access? What if you could share your masterpieces with hundreds of students in Alexis Bonavitacola Art Classes Facebook Community, where my students come together to encourage, support, and celebrate their creative journeys with like-minded artists? With clear, concise, instruction, (and a whole lot of joyful painting and learning to go with the flow), my intention is to graciously share my techniques in order to inspire you on your own path to creative confidence. Learn all about creating harmonious color palettes in this Online Studio Workshop, with content from artists Alexis Bonavitacola, Beverly Ash Gilbert, Kellee Wynne Conrad & Jamie North! Tiptoe through a garden of gorgeous florals created in alcohol inks and mixed media. Let me share with you all of my "gardening" techniques in floral design. 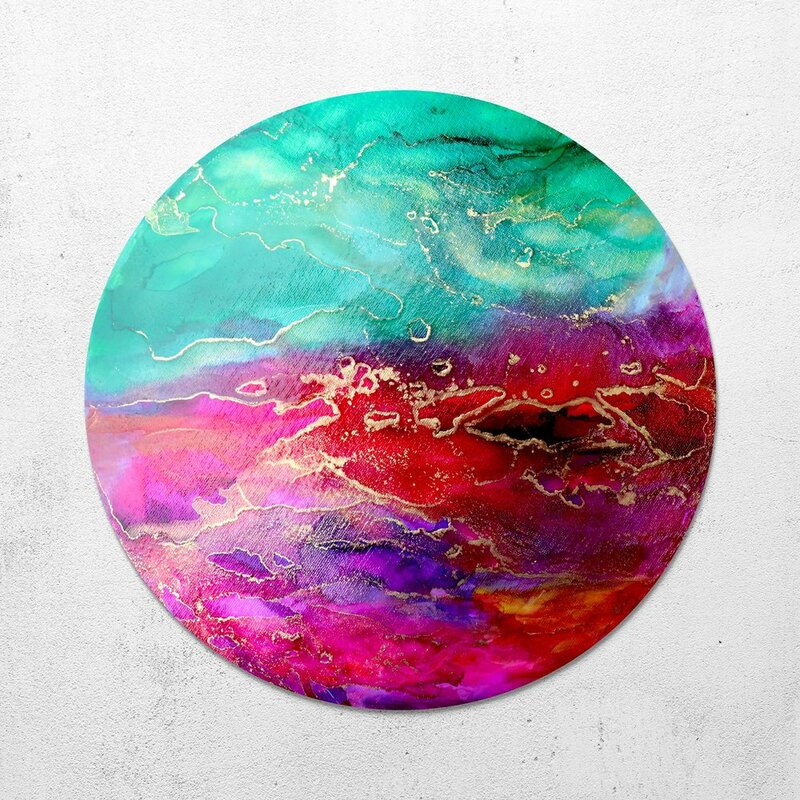 Discover my techniques in creating out-of-this-world colorful, abstract paintings on a variety of round disks using my favorite medium: alcohol inks. Did you have any hesitations before signing up for the workshop? I was so excited to sign up for this workshop because I learned so much and so enjoyed the Summer of 2017 Energy, Motion, and Flow class, and it was obvious from that experience that any course taught by Alexis would be top notch! Why did you decide to enroll in the Workshop? What did you like about it? I especially enjoyed painting expressive landscapes in the Energy, Motion, and Flow class, and this looked like it would be similar. Also, after seeing the circles Alexis had painted, especially on aluminum, I just couldn't wait to try it!! Did you find the Workshop content easy to follow? This workshop was so organized and easy to follow. There was a wealth of information and a wide variety of products to try out. The videos were very professional and so inspiring! Do you think the Workshop curriculum allowed you to feel successful in creating the techniques that were demonstrated? Absolutely! I created a number of Circles of Love, both on canvas and aluminum, in various sizes, and it was a new experience to work in a circular format and use greater amounts of ink and blending solution. I fell in love with Piñata gold ink, also, and became very comfortable using it. I found that I was more apt to use the gold in my other work after taking this class. Do you enjoy being a part of the Facebook Group, and having a place to post your artwork from the Workshop, and connect with fellow artists? The Facebook Group has been a wonderful experience from day one. My fellow artist are so loving and supportive, and I am always amazed at how ever present Alexis is in the group, giving support and advice to all of her students in such a prompt manner. She is truly an extraordinary teacher! Besides art techniques, is there anything else you gained from taking this workshop? This course inspired me to branch out and try different substrates, as well as trying different finishes. My favorite Circle of Love has a beautiful sheen created with the Tri-Art Liquid Glass. Having taken several classes now, I feel like the group has become closer, and it truly feels like a safe place. What are some of your biggest successes, achievements, breakthroughs, or skills gained as a result of taking the Workshop? I feel like I became more aware of color combinations, and the different effects of the inks, especially on canvas and metal, as both substrates were new to me. I also became more comfortable working on larger pieces. "Thank you for sharing your knowledge so freely, and being genuine and real. It’s easy to follow what you’re doing in your demos, and you’re good at not being intimidating, just helpful. Your approach to teaching is so encouraging and fun. I have had a blast, and learned a huge amount. I feel more confidence in my abilities because of you! It has been a long time for me to get to this point, and your class was the breakthrough for me. I am so glad I took the chance on it! Thank you, thank you!"